Tencel� Lyocell was introduced to the market and we were impressed by its unique characteristics. 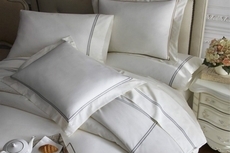 It's soft as silk, more absorbent than cotton, cooler than linen, durable and Eco-friendly. We experimented with multiple combinations and found that Premium Long-Staple cotton mixed with Tencel Lyocell produced the most comfortable sheets while retaining the characteristics of Tencel� Lyocell. We next focused on different weaving patterns to produce soft and durable sheets combined with a luxurious pattern in the details.